Swore I never, ever would. I'd either borrow or rent. But I did. After this year, when I my time was severely limited between the bad weather and having the flu in May, and my energy to turn the garden by hand was reduced from the flu, I decided I should have one. I need a better photo -- that was taken the night it came home from Craig's List. I'll probably use it to cultivate during the year, too (cultivation is running it shallowly to kill weeds, as opposed to tillage which disturbs the soil much more deeply). 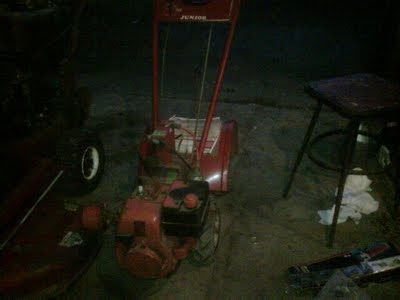 It's a Troy Bilt Junior with a Tecumseh H35 Engine. Tecumseh Basic Troubleshooting & Service Guide (or my archive copy).